A user over at Reddit posted something interesting in the Android section. 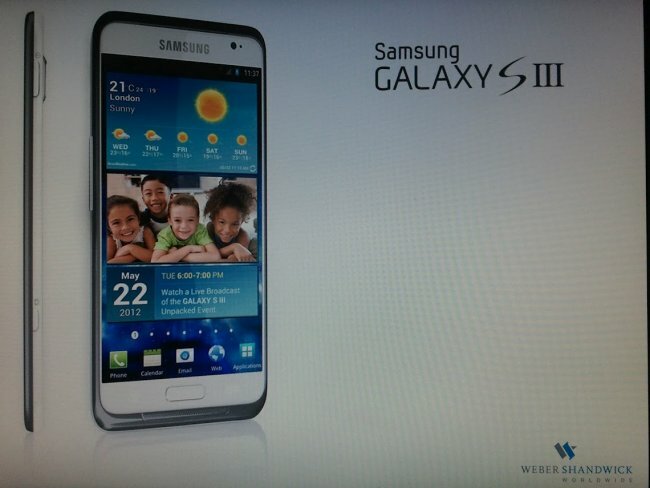 This image is supposed to be the Galaxy S III. You’ll notice that the render shows a thinner design, a dedicated camera button to the side and a 16:9 display. But the most obvious change is that it has the same ‘lips’ as the Galaxy S Wi-Fi 4.2, supposedly to avoid those accusations of copying Apple. No one wants more lawsuits. This is more than just a re-edit of the Wi-Fi 4.2; the front camera layout is different and in a different location. Looks like the software is Android 4.0 plus TouchWiz. It could be a leaked presentation slide to prepare for the release. The bottom line is that we just don’t know if this is genuine or not, but it is consistent with the things we that we do know and suspected.